It’s cookbook mania out there these days and as a food blogger I’ve become a little picky. I don’t want another cookbook in my kitchen unless it’s totally awesome. 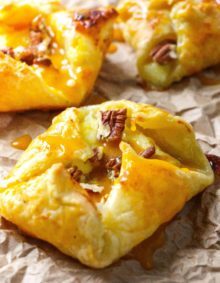 There are a few recipes that in my opinion are such basics that no matter what your preferences are you should be able to make the recipe and it should be a crowd pleaser. Recipes like a basic burger, a perfect cookie and waffles. Waffles are not meant to be soggy, flat, or bland. 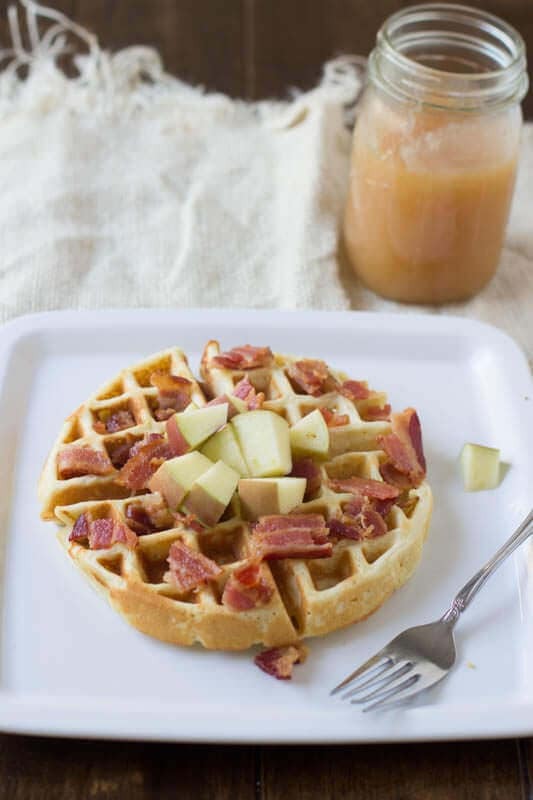 These apple bacon waffles with cider syrup are amazing. I could seriously slurp the cider syrup down. And it all comes from one of my new favorite cookbooks, The Recipe Girl Cookbook. 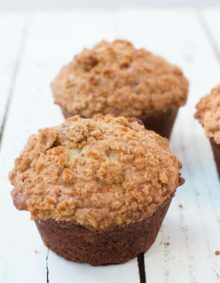 Lori has been making recipes for years and posting them to her scrumptious site, Recipe Girl (seriously go try the browned butter snickerdoodle blondies) which I have been following and drooling over all the yummy recipes. When I heard that Lori was doing the whole cookbook thing I couldn’t wait to get my grubby little hands on it and see if it was everything a cookbook should be. And it is. This particular recipe, especially the syrup quickly became our favorite in the entire book. I know, it’s just breakfast to many people, but first of all we love breakfast for dinner, and second the recipe rocks. I love when a recipe not only turns out just like it’s supposed to, but it also hits sweet, savory, salty, crisp and fluffy all in one bite. That, that my friends is a good recipe. 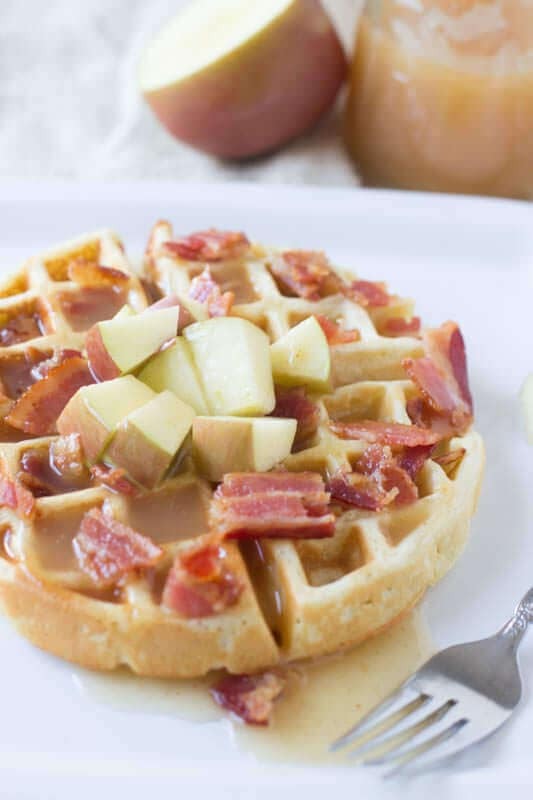 The waffles are seriously delicious and we love that tiny hint of tart from the apples, salty crispness from the bacon and the sweet from the syrup plus pack in a fluffy waffle and I’m drooling as I type this! Soggy waffles are most often caused by a waffle iron that is not hot enough. To keep waffles from getting soggy before serving, heat an oven to 200 degrees. Put a cooling rack on top of a cookie sheet and place cooked waffles on the cooling rack. Keep the waffles in the oven until ready to serve. Can Waffle Batter Be Made Ahead of Time? Waffle and pancake batter can be made the night before. Baking powder may lose some of its potency overnight, so you may want to add a little before cooking the waffles. Remove the batter from the refrigerator and let it warm just a little. Sprinkle a little baking powder in and stir gently. Is There a Difference Between Waffle and Pancake Batter? The only difference is the fat content. Waffle recipes usually contain a bit more butter or oil than pancakes. To make the syrup,place the corn starch, sugar, and pumpkin pie spice in a medium sauce pan. Whisk in the cider and lemon juice. Turn the heat to medium and bring to a boil, stirring often. Reduce the heat to low and continue to simmer until the mixture begins to thicken. Remove the pan from the heat and add the butter, whisking to combine. In a medium bowl, whisk together the dry ingredients, flour, sugar, baking soda and salt. In a separate bowl, combine the buttermilk, milk, butter and eggs. Add the dry ingredients to the wet ingredients and stir to combine without over mixing. Stir in the apple and bacon. Heat a waffle iron according to manufacturers instructions and spray with non-stick spray. Scoop the waffle mixture into the waffle iron and close the lid, cooking per instructions. Serve with warm apple cider syrup. Oh yes, sign me uposted! Yum! These are all the flavors and textures I love in a breakfast. We may just have to eat this for dinner this week. That Lori, she really knows what she’s doing! These waffles look wonderful, Carrian! Love that sweet-salty flavor combination. No wonder they’re a family favorite! 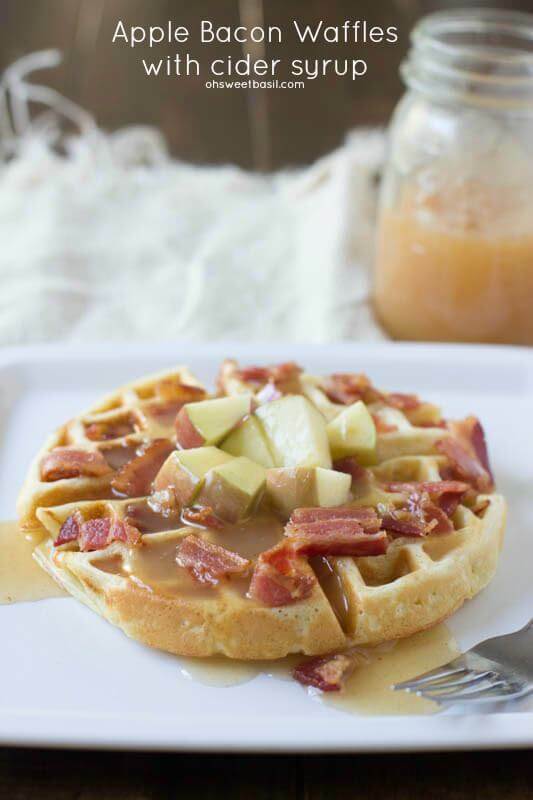 Such a fun waffles recipe! Mentally writing this waffle a love letter as I type. I’m hooked!!! These waffles are amazing! Love the sound of the cider syrup! i know someone who would just love these! These do look absolutely divine! 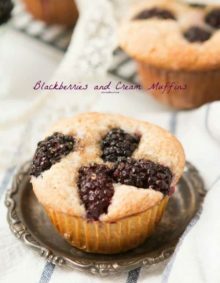 Lori’s cookbook is just great – full of good recipes! You make some pretty awesome dishes yourself too, Carrian!!! I have a ton of cookbooks too and my husband said NO MORE. This recipe from Lori’s cookbook looks amazing. Yummmmm I want to make this this weekend. Awesome! Carrian, these waffles look amazing! 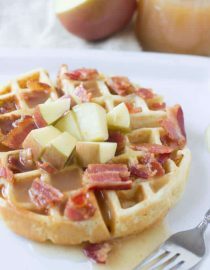 What could be better than apple and bacon, yum! Yum, these look so incredible!!! Those do sound extra delicious…especially that cider syrup. YUM!!!! 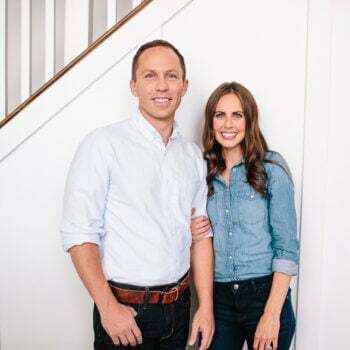 I need to get Lori’s cookbook too! Thee waffles sound just too awesome! 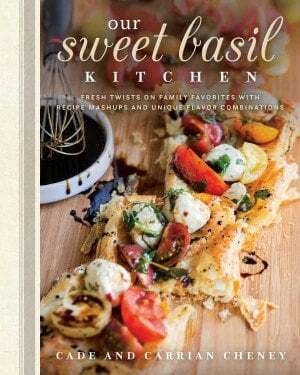 Lori’s cookbook is a must for any home cook! It is filled to the brim with amazing recipes! These are next on my list!